In a non-stick pan, over a medium-high heat, add the oil. Once hot, lay the fish skin-side down. After 2 minutes, turn the fish over and cook the other side for 2 minutes. While this cooks, heat the Sambal Hijau in a small pot over a low-medium heat (to avoid splattering), or heat it in the microwave in a covered glass dish. 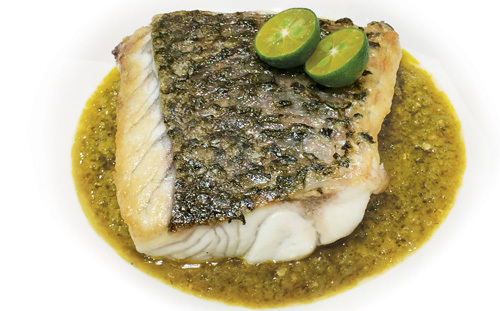 Once the fish is cooked (about 4 minutes total), pour the Sambal Hijau into a serving dish then place the fish on top. 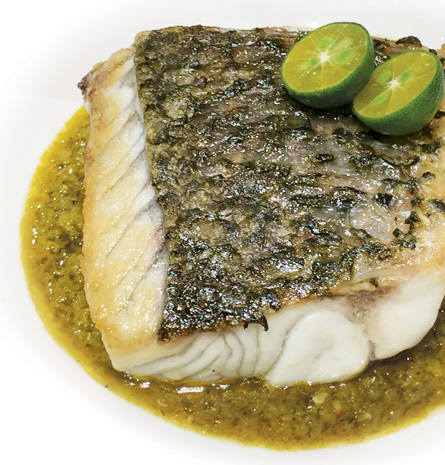 For an extremely easy version (with minimal washing up), add the Sambal Hijau to the fish while still in the pan, which will poach the fillet in the sauce. Slide onto a serving dish. Finish the dish with calamansi lime. Can be served with brown, red, or white rice, or quinoa.